Until 2005, natural gas had the highest value among energy resources. However, since 2006, the wealth from oil sands has exceeded that from other energy resources, mainly on account of increased reserves. Canada's oil sands in Northern Alberta contain vast quantities of crude bitumen, one of the largest hydrocarbon deposits in the world. 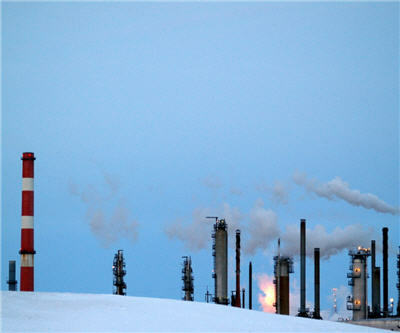 In 1990, the value of the crude bitumen in the oil sands represented $19 billion or 13% of energy resource wealth. By 2009, the value of crude bitumen had increased 23-fold to $441 billion, more than the combined value of coal, crude oil and natural gas. In 1990, oil sands reserves under active development amounted to around 500 million cubic metres; by 2008, they had increased eight-fold to 4,300 million cubic metres, thanks to improvements in extraction technology, new discoveries and an increase in the global demand for crude oil. Between 1990 and 2009, the value of natural resource assets declined several times. It fell first in the early 1990s as a result of a recession in North America. It declined again in 1998 in the wake of the East Asian financial crisis, and a third time in the early 2000s during the economic slowdown that followed the events of September 11, 2001. Most recently, resource asset values declined in 2009 during the global economic downturn. Since 2000, energy resources have contributed the most to the overall value of natural resource assets. However, they have also been subject to the most volatility. 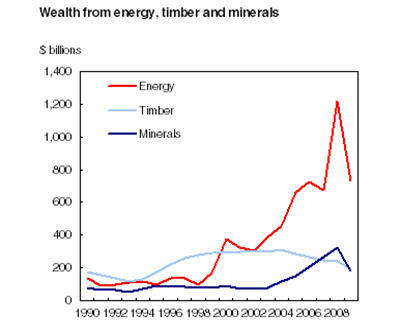 Mineral resource wealth remained relatively constant from 1990 until 2002. Between 2003 and 2008, mineral assets increased significantly in value as a result of increased world prices for mineral resources. The higher prices provided incentives for exploration and development and the discovery of new deposits. Click here for the complete study on the economy and the environment. MINING.com reported on Tuesday Statistics Canada data on the first quarter population estimates for the country and the provinces shows Alberta’s population reached 3,758,200 at the end of March, an increase of just under 15,500 since the start of the year, double the average growth rate in all of Canada. Net inflows were the highest since 2006.